In the near future, a woman is writing in the depths of a forest. She’s cold. Her body is falling apart, as is the world around her. She’s lost the use of one eye; she’s down to one kidney, one lung. Before, in the city, she was a psychotherapist, treating patients who had suffered trauma, in particular a man, ‘the clicker’. Every two weeks, she travelled out to the Rest Centre, to visit her ‘half’, Marie, her spitting image, who lay in an induced coma, her body parts available whenever the woman needed them. As a form of resistance against the terror in the city, the woman flees, along with other fugitives and their halves. But life in the forest is disturbing too-the reanimated halves are behaving like uninhibited adolescents. And when she sees a shocking image of herself on video, are her worst fears confirmed? 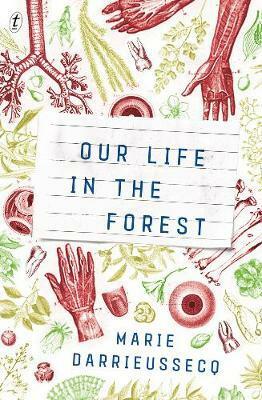 Our Life in the Forest, written in her inimitable concise, vivid prose recalls Darrieusecq’s brilliant debut, Pig Tales. A dystopian tale in the vein of Never Let Me Go, this is a clever novel of chilling suspense that challenges our ideas about the future, about organ-trafficking, about identity, clones, and the place of the individual in a surveillance state.